Palm Beach Dramaworks opened its concert presentation of Stephen Sondheim's Company as the latest in its Musical Theatre Masters Series on August 7, 2013. Company (1970), which marked the beginning of the legendary artistic partnership between composer/lyricist Stephen Sondheim and director Harold Prince, is considered the first concept musical. Based on 11 one-act plays by George Furth, who adapted his material for the musical, Company consists of a series of vignettes in which a 35-year-old bachelor named Bobby observes and interacts with his married friends as he struggles to make a commitment. Clive Cholerton directed a cast that included Katherine Amadeo, Natalia Coego, Nick Duckart, Maribeth Graham, Alexandra Hale, Laura Hodos, Wayne LeGette, Leah Sessa, Barry Tarallo and Quinn VanAntwerp. NOTE: some reviewers mentioned that some roles were cut from the original staging: Florida Theater On Stage reports that the script has been restored at the request of the licensing agent. ...the glowing joy and slight frustration suffusing Dramaworks-Cholerton’s third entry in its Musical Theatre Masters series, an unassailably well-crafted, well-performed, downright entertaining production of Stephen Sondheim’s Continental Divide of American theater, Company. Cholerton and musical director Paul Reekie lead a generally terrific cast applying admirable skill, intelligence, wit and emotion to superb but challenging material. But as with Dramaworks’ equally fine Man of La Mancha last month, a dimension and a depth are missing. In this case, it’s the wrenching urban angst, the desperate loneliness carefully camouflaged and damped down under studied sophisticated miens. Cholerton and his talented troupe have used that time well. Scripts perch on music stands as a safety net, but the performers have it all pretty cold, allowing Cholerton to move them all over the stage, even adding some minimal choreography. As with La Mancha, which had a different musical director, a few ballads are played just a tad too fast, making it tough for the actors to work with the lyrics. Conversely, the difficult triple-paced patter songs, Hale’s “Getting Married Today” and Natalia Coego’s dead-on “Another Hundred People” seemed just right both in pacing and in the impossible task of enunciating the pretzel lyrics. All are especially deft with comedy such as Maribeth Graham and LeGette’s competitive couple who know exactly where to slide in the knife and how to salve the wounds with love afterward. Hale, whose day job is as a marketing associate at Florida Repertory Theatre in Fort Myers, should be welcomed back anytime she wants and she gets fine support from Nick Duckart as her patient fiancé. Hodos is, as always, delightful. Her Joanne isn’t as acerbic as her predecessors, but she brings a different and valid vibe to the “Ladies Who Lunch.” Barry J. Tarallo makes his love for his verbally dismissive wife perfectly credible. The trio of girlfriends are also up to the task: Katherine Amadeo’s “just friends” Kathy, Leah Sessa’s flighty stewardess April and Coego’s young woman passionately in love with New York City. VanAntwerp is a competent hand – a veteran of three years on Jersey Boys – with a sweet open face and solid enough voice, but he makes the least impression. Bobby is a deceptively difficult role... VanAntwerp doesn’t have the chops yet to be able to summon that up in a week’s time. ...as one of my favorite musicals of all time, I’m setting the bar almost absurdly high. This production is so solid that anyone who loves Sondheim should travel to West Palm Beach to entertain Company. The good news is a confident, polished concert of Stephen Sondheim’s Company, now playing through Sunday. The bad news? After this very satisfying evening and the previous, even better semi-staged Man of La Mancha, we may never see a fully produced musical at this West Palm Beach playhouse again. Cholerton has a company of pros, including veterans of his previous concerts — Wayne LeGette, Nick Duckart, Leah Sessa and Laura Hodos — and a Broadway ringer (Quinn VanAntwerp of Jersey Boys) as Bobby. Also assets are two newcomers to Dramaworks, Alexandra Hale as panicky bride Amy and Natalia Coego as offbeat gypsy Marta. ...on balance, this is Company well worth keeping. It does not have a 16-piece orchestra either, but it does have musical director Paul J. Reekie on piano, so the score sounds fine. A fully staged production would be preferable, but with a show like Company, its many pleasures come through well enough in concert. 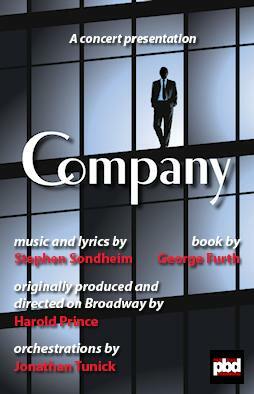 Smart, biting and achingly human are all words that could describe Stephen Sondheim’s Company. The literate musical fares well in Palm Beach Dramaworks’ concert production. As has been true throughout this series, Clive Cholerton’s direction mines the meanings behind the words and music, and infuses the show with life with artful stage movement and scene-setting projections. Kudos to musical director and pianist Paul Reekie and the cast, especially in light of the production’s brief rehearsal time. VanAntwerp’s Bobby is as charming and elusive as the script requires, though his voice wasn’t as at home in some of the songs as could be wished. Still, he fills Sondheim’s more emotional numbers, such as Marry Me a Little and Being Alive, with an intensity and honesty that’s difficult to resist. Hodos brings bite and vocal assurance to the role of the much-married yet secretly insecure Joanne in the scathingly insightful The Little Things You Do Together and The Ladies Who Lunch. Other standouts include Hale, in the frenzied Getting Married Today; LeGette, hysterically urbane as Harry propositions Bobby; and Sessa as April, who’s so dumb she’s brilliant. The concert presentation of Company plays at Palm Beach Dramaworks through August 18, 2013.